Mindfulness –noun the state or quality of being mindful or aware of something. I see too many people going through the day thinking of everything but what is going on around them. Instead of listening, they are planning what to say when the other person is done. Rather than paying attention to traffic they are thinking about what to pick up on our way home, texting a friends, putting on makeup, or eating dinner. I see parents looking at Facebook on the phones while their kids talk to them. 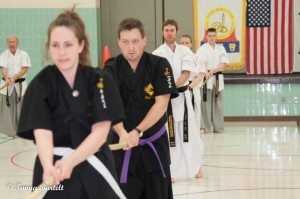 Martial arts demands our focus here and now. At the most basic level, if we don’t pay attention to what our sparring partner is doing, we are going to get hit. But it goes deeper than that. 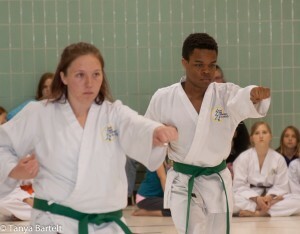 We bow when we come into the Do Jang, giving respect to this place where we learn and practice our Tae Kwon Do. Failing to be mindful in class is disrespectful of our instructor, and ultimately ourselves. What do we learn when we don’t pay attention? The breath at the beginning of each form is an aid to focus on the now. Pay attention! Then take that mindfulness out into the world. Not only will you be prepared to react to anything, including attacks and crazy drivers, but you will better relate to the people in your life, will see the beauty of the world around you, and be able to achieve with hard work your potential if you pay attention to what is happening in the here and now.